Like most brilliant inventions, SCOTTeVEST started with a forward-thinking individual who wanted to solve a problem faced on a daily basis. At that time, technological gadgets were becoming more popular and Scott Jordan wanted to find a way to carry all of his gadgets “comfortably, and not looking like a geek.” Knowing that others were facing the same problem, 16 years ago he created the company SCOTTeVEST, and its first product - the eVest 1.0. In my most recent interview, I got to chat with Scott about SCOTTeVEST and what he says is the “one reason for my success” – his organized and persistent methods of follow-up. 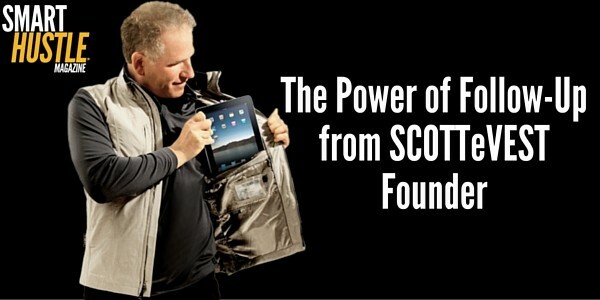 SCOTTeVEST launched in 2000 and started a “pocket revolution” for the modern traveler. The initial vest was built on the concept of a fishing vest or a photographer’s vest, where uniquely designed pockets were integrated in order to accommodate gadgets and digital devices. The business has now evolved into a full line of over 50 different items, including vests, jackets, shirts, pants, boxers, hats and more. The sharp, sleek design of SCOTTeVEST products makes them not only an excellent way to travel with your gadgets but also fashionable items for your wardrobe. In 2012, Scott received an extra 15 minutes of fame by appearing on ABC’s Shark Tank. Having spent 12 years to build a successful business, Scott was there to pitch the licensing of TEC-Technology Enabled Clothing, but the Sharks had a different idea. They tried their best to stake a claim in SCOTTeVEST too, and so Scott refused their offers and walked away without a deal. You can read his side of the Shark Tank story here. Although Scott didn’t partner with the Sharks, he has formed partnerships since. SCOTTeVEST’s list of Advisory Board members includes big names like Peter Shankman and Steve Wozniak. The company has been awarded several patents and has sold nearly 10 million pockets. According to Scott, the skill of follow-up comes innately for some, but for most it is a learned skill that must be developed and practiced. For Scott, follow-up is instinctual. In our interview, he recalls that even before SCOTTeVEST, as a law student he practiced follow-up in seeking a summer internship by continually updating his prospects with resume and grade changes. As Scott explains, follow-up is so important because most of our communication is done through email, but emails are easy to forget as they get piled up in the inbox. Persistent follow-up will help you nurture your relationships and it helps you stay on the top of people’s minds. Scott uses follow-up as a tool in all aspects of his business. In the interview, he gives several examples including using it with customer inquiries, advertising inquiries, sales, networking, and internal business operations. To learn more, click to play the full interview below. As Scott mentions in our interview, for most people, follow-up is a skill that must be learned and practiced – but it’s a valuable tool that will help boost your business. Here are some of Scott’s top tips for successful follow-up. Modern technology makes follow-up easier than ever before. Scott uses tools like Active Inbox and Inbox by Google to turn emails into a flow of follow-up tasks. Using the fore-mentioned tools, you can create systems that make follow-up organized and orderly. Scott has implemented a zero-inbox policy at SCOTTeVEST to make sure all incoming emails are pushed into the proper system instead of sitting in the inbox. Look to make your follow-ups valuable by providing additional information and not just asking the basic ‘what’s the status?’ question. Once again, follow-up is a tool that will help you manage your relationships – with customers, vendors, coworkers, mentors and so on. As such, personality and personal context can work to your advantage. If you wait too long to follow up, you may lose your chance. For example, if you take too long to answer a customer inquiry, you may miss the sale and push that customer to do business elsewhere. Your follow-ups should be timely and persistent without being annoying. However, you also have to avoid giving up too soon. Knowing when to stop following up is something you can learn with practice and experimentation. Scott makes a convincing argument for the importance of follow-up and how it can help your business succeed (especially because so many other businesses are not doing it properly!) I encourage you to listen to the interview in full to hear all of his tips and examples of how he uses follow-up in SCOTTeVEST and his other business ventures.